Relief pitchers were always a big part of the game, but they’ve taken on a much bigger role and it’s carried over in fantasy baseball. Much has been made of the lack of innings from starters these days as teams gear towards stronger bullpens. Don’t get me wrong, I want a to leave my draft with a top 10 closer and I’ll roster a few relievers along the way, but I’m on the lookout for relief pitcher sleepers on draft day. I’m looking for value and I’m looking at closer battles. I’ve identified a few below that I’ll have my eye on. I cringe when I see someone spend a high draft pick on a closer or leave their draft having selected two with their first 10 picks. Over the past few years, Kenley Jansen, Aroldis Chapman and Craig Kimbrel have failed to live up to their expectations. It doesn’t mean they aren’t top end talents at their position, it just means when they suffer so does your squad. Whether it’s through regression or injuries, it doesn’t matter. The risk is not worth the reward. You’re better off taking a bat or a starting pitcher in the fifth or sixth round. I think there’s a ton of value in rostering middle relievers such as Josh Hader, Adam Ottavino, Matt Barnes, Chad Green or Dellin Betances. I’d much rather rock a reliever who will get me 7-10 strikeouts in a week as opposed to streaming a starter who has a better chance of blowing up my ratios. Saves are nice, but they are not the only thing relievers provide. Each year saves pop up on the waiver wire. Don’t let it be the end of the world if you leave your draft with just one or two closers. Two years ago, I left the FSTA draft with one closer (Kelvin Herrera) and I had four by mid-season (Corey Knebel, Brad Bach and Blake Treinen). Yeah, I led the league in saves that season. Take a shot on a few relief pitcher sleepers, but be active on the wire. 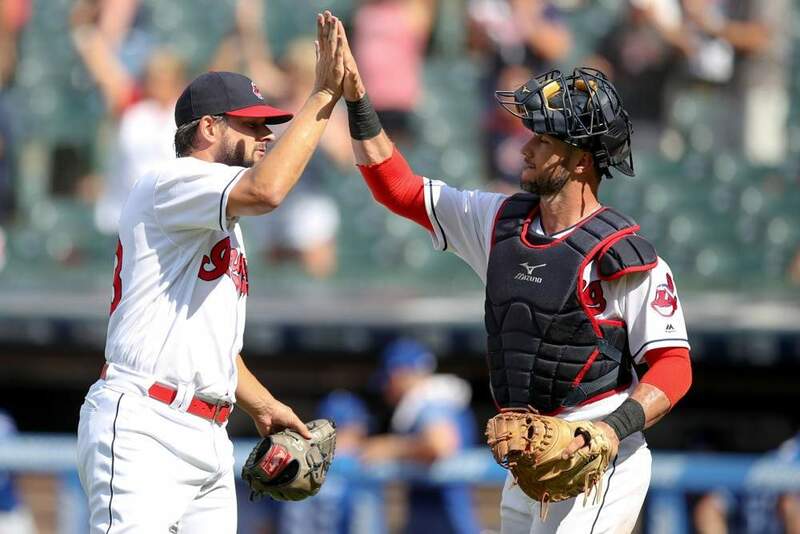 Brad Hand has a firm hold on the closer job in Cleveland after the Indians failed to re-sign Cody Allen and Andrew Miller. The Indians have lost some of their offense from last season, but they still have one of the strongest rotations in the game. Hand has racked up 53 saves over his last two seasons and took over the role in Cleveland after the club acquired him from San Diego. He set a career high with a 13.3 K/9 and he has at least 100 strikeouts in each of his last three seasons. He also has a sub three ERA in each of those campaigns. When the San Diego Padres flipped Brad Hand to Cleveland it opened up an opportunity for Kirby Yates. He became the full time closer in San Diego and he finished the year with 12 saves and just the one blown opportunity. Yates followed up his 13.98 K/9 and 17.3 SwStr% season in 2017 by rocking a 12.86 K/9 and 16.7 SwStr% last season. A slight decline, but still very impressive marks. His 29.2 K-BB% in 2018 ranked sixth among relievers. As mentioned earlier, Cody Allen lost his job with Cleveland last season when the club landed Brad Hand. Allen’s 10.75 K/9 and 4.43 BB/9 were his worst marks since 2012 when he tossed 29 innings. His 4.70 ERA was by far his worst mark of his career and he allowed a career high 11 home runs. Even with last year’s poor showing, Allen represents a 2.98 ERA for his career and he has 149 saves. The Angels desperately needed a closer and they have one with Allen. He’ll at least be the front runner on opening day. Justin Anderson and Cam Bedrosian failed when given the chance to take over from a now departed Blake Parker. Don’t count your Ty Buttrey shares out yet, but this is Allen’s job to lose. His struggles last season would have made him a pass if he were still a member of the Indians, but the opportunity in L.A. along with the price tag, makes him an intriguing late round target. Allen’s ADP will likely rise now that he’s a member of the Angels. He has RP20 upside. The closer job in Atlanta is one of several battles I’ll be following closely during the spring. It’s one I anticipate A.J. Minter winning as Arodys Vizcaino’s shoulder issues present red flags. Vizcaino may start the season as Atlanta’s closer, but I don’t expect him to finish with the job as the club may manage his innings. Minter’s 10.13 K/9 and 3.23 BB/9 are nothing to get excited about, but they are better marks than what Vizcaino had in 2018. His 2.11 ERA was better than Minter’s (3.23), but Vizcaino had a very high 91.8 strand rate. Battles to keep an eye on: I like those in BOLD.